At this point, everyone knows that wireless chargers are awesome. They provide a much more convenient way to charge your phone without having to fumble with cords and connectors. What some people still don’t realize, however, is that you can same a ton of money by staying away from big-name brands and getting the same thing from smaller vendors. Today is a perfect opportunity thanks to Amazon’s one-day sale. 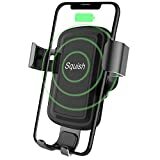 Pick up a Squish Wireless Charger with fast charging support for just $13, and add a $21 Squish Wireless Charger Car Phone Mount to the mix so you don’t even have to worry about plugging your phone in while you drive. 7.5W and 10W Fast Wireless Charger: Automatic identification for all Qi enabled phones. 10W Fast Wireless Charging for Samsung Galaxy S9/S9 Plus/S8/ S8; 7.5W Fast Charging for iPhone X/8 Plus. Safety Design: Wireless Charging Pad Qi certified by WPC with over-current, over-heat, over-voltage, and short circuit safeguards. Case Friendly: Supports most phone cases (phone case thickness within 0.4 inch). Please do NOT put any materials on the back of your device or directly onto your wireless charger while charging. 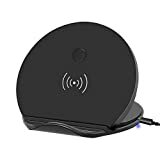 What You Get: Fast wireless phone charger pad holder, Micro USB cable (Not including QC2.0/3.0 AC Adapter), User guide, Service Team letter. In our mission we aim to make your Mobile life simpler and easier so you can focus on what really matters. 2 IN 1: Wireless charger and phone mount are combined as one, power your device without the need of messy cables inside your vehicle. As you place your phone inside, the clamps automatically fit to your phone with a secure grip. Together with 360-degree rotating cradle tahat provides you flexible viewing angle making this wireless charger the real deal. 10W (Max) fast charging, one second connection: Support 9V/1.8A quick charge and 5V/2A standard charge. Built-in intelligent clip, self- adaptive to the device required current and then charge quickly. Qi standard approved, won’t damage or shorten the battery life your like other inferior products. (To achieve best performance of this wireless charger, QC2.0/QC3.0 car charger is suggested to be adapter). Easy operation: It adopt anti-scratch & anti-slip rubber material base padding for a secure and safe grip, and gravity closure design that can be automatically locked with gravity after a mobile phone is placed inside and unlocked by losing gravity after your phone is taken away. Its simply quick mount technology allows you for safe and secure driving no matter you talking, navigating, listening to music or charging. Compatibility: Passed various tests, the mount works well with most phones(best for width under 3.7in, thickness under 0.6in). Suitable for most phone cases such as full cover, silicone/rubber, hybrid, plastic etc.But UAG and Otter cases are not included. Can be installed on almost any vehicles air vents, stay secure even in the bumpiest road.Note,Do not put any materials like key ring, metallic phone case etc. on the back of phone device or wireless charger directly in the process of charging. Quality Assurance: Contact seller for Anything! Squish provide high qualty products and value customers’ shopping experience. We support 30 Day Money Back Assurance for ANY Reason, and One Year Replacement or Full Refund Warranty for Quality-Related Issues.